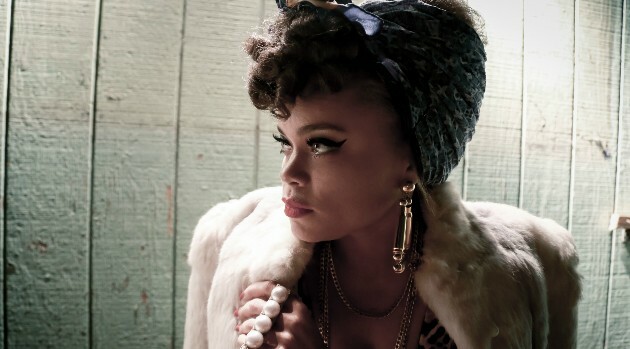 Andra Day is still stunned by the success of her empowering anthem “Rise Up,” from her Grammy nominated album Cheers to the Fall. However, the singer tells ABC Radio that her life hasn’t changed as much as you might think. The nominations seem to have quieted the constant comparisons that Andra receives with artists ranging from Rihanna to Amy Winehouse. The singer adds, “I am who I am and I’m confident in that and, you know, it’s always complimentary and I think its flattering and it doesn’t chip at my security as a person,” she says. Next month will see Andra making her first Grammy performance — she’ll team up with pop singer Ellie Goulding for a duet. The ceremony airs February 15 at 8 p.m. ET on CBS. In related news, “Rise Up” peaked at number 20 on Billboard‘s Hot R&B Songs chart last week, selling 11,000 additional copies. It’s Day’s second entrance on Hot R&B Songs following the holiday duet with Stevie Wonder, “Someday at Christmas,”which debuted at number 24 last month.